February 5, 2012 - Ice may be fun to skate on, but for jet engines it can pose a serious threat. Freezing mist may creep up inside the engine, coat key parts in ice and impact engine performance. The Federal Aviation Administration (FAA) requires that manufacturers run engines through a series of rigorous icing tests and extreme scenarios. The jets must keep the power they need in tough wintry conditions. This week, GE opened a $50 million jet engine testing facility on the icy plains surrounding the James A. Richardson International Airport in Winnipeg, Canada. 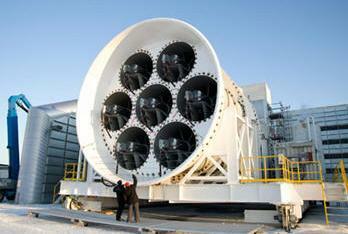 At the heart of the testing site is a 21-foot wind tunnel equipped with seven high-powered fans. The tunnel, which looks like the bottom of a spaceship knocked on its side, can generate winds blowing at speeds up to 65 miles per hour. An array of 125 nozzles sprays micron-sized droplets into the freezing gale and the resulting ice cloud then pummels the hapless engine. The various testing regimens are precisely prescribed in FAA manuals, from the size of the droplets, to wind speed, temperature and length of exposure. An engine must power through the mayhem to earn an FAA certification. GE also feeds gathered data back to aviation engineers to fine tune and improve on their designs. The site, which will be operated by the Canadian aircraft service company StandardAero, will test the GEnx, LEAP, Passport 20 and other engines. Kevin Kanter, engineering executive at GE Aviation, said that Winnipeg was an ideal location because every year it has on average 50 days when temperatures fall bellow zero. It has freezing weather from November to mid-April. GE’s other testing facility in Peebles, Ohio, has not had any sub-zero days this winter for example and is generally getting warmer. “At Peebles, you can’t get enough days to test icing,” Kanter said.